If I've learned anything over the years, it's that an Ani DiFranco concert is not a victory lap. It's not a greatest hits party. DiFranco isn't on stage to pose (heck, it's 2010, and you couldn't even bring your camera into the venue). She's not touring to re-live her past, as much as some of her fans might wish that to be true. Instead, DiFranco, as you probably know, is fiercely independent. She's interested in the now, in the moment where she can deliver her unique talents when the time is right. Case in point: Mid-way through her set at The Pageant, she remarked that a stretch of the street where the venue resided had been renamed "Barack Obama Boulevard." So, she did what she hadn't done in while -- she played the song she wrote about Obama after he won the 2008 election. Yep, Ani DiFranco does what she wants. Her set was filled with newer material from 2008's Red Letter Year, and unreleased songs, most of which the crowd reacted warmly to. 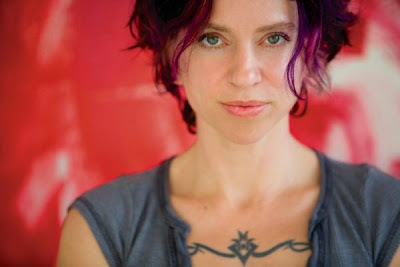 She remarked how her older songs don't thrill her so much these days; before she performed "She Says," DiFranco explained how one of her friends hand to print out lyrics, set them before her, and hand her a guitar so that she could "re-learn" the tune. The performance was splendid, even though it might have been the result of someone pulling her artistic teeth. A few favorites did make their way into the set near the end. Seconds after starting "Both Hands," DiFranco could sense this was what her fans had been waiting for all night, so she stopped and remarked that it was for "you....and you...and you!" It felt like a genuine dedication, although I'm guessing she'd rather have that kind of reception for something she wrote the day before, not years ago. But as free of a soul as Ani DiFranco is, you can't deny that those first notes of "Both Hands" or "Untouchable Face," which she also played, are special moments, too. They're just not the songs that keep DiFranco on the road after all these years.